I love receiving the monthly Foodie Penpal box...because you never know what will be inside. 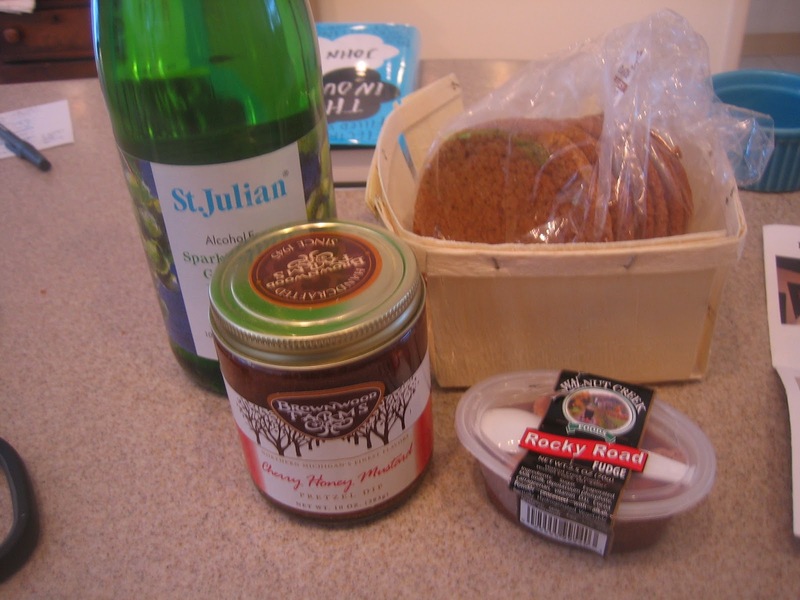 This month I received a box from Karen in Michigan, who sent Michigan specialties, including rocky road fudge, thin, crispy ginger cookies, a bottle of sparkling grape juice, and a cherry honey mustard pretzel dip. These goodies arrived on a cold, drizzly Friday afternoon, along with a note describing Michigan's many vineyards. Karen explained that St. Julian's was a childhood favorite--I am secreting the bottle of grape juice away for Passover, which is coming up much faster than I would like--eek! even get everything out of the box. The real highlight here, though, is that package of ginger cookies. They are thin and crispy at the edges, but soft toward the middle--absolute perfection. David tore into them and pronounced them some of the best cookies he'd eaten in ages. My favorite part of participating in Foodie Penpals is receiving regional specialties--I would never have thought that Michigan cherries mixed into honey mustard could be so good! Thanks to Karen for this wonderful box--I really appreciate it. If you are interested in learning more about Foodie Penpals, head over to The Lean Green Bean. What a great idea, a lovely surprise to come home to! Foodie penpals,sound fun :) what a great ingredients in the box. What a fun tradition! I wouldn't have pictured cherries in mustard either, but sometimes I'm surprised by the combinations that work. I love surprises especially when it has to do with food! All of it sounds delicious! Those ginger cookies do look extremely thin & crispy! Glad to see you back to regular blogging! How fun to get a box of treats. I would totally have eaten every ginger cookie in the box. I'm not a big cookie eater, but ginger and lemon cookies don't last long around me. The cherry mustard dip does sound good! I'm sure you enjoy receiving the Foodie Penpal box! And we do enjoy looking what's inside the box too. :) David is funny! At least he left some. I might finished them all if I see them. It's funny how sometimes contradicting things work perfectly together! Krista, it's such a fun idea exchanging goodies with 'foodie penpals'...always great to get a box of surprise goodies. 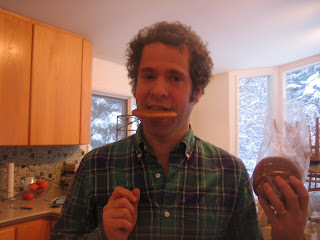 Love the ginger cookies, and David sure looks happy eating them! I love the foodie penpal idea. Makes me think what would I send someone from Pennsylvania. Heinz ketchup, maybe. Hershey's chocolates. I'd come up with it! Penpal foodie box sounds TOO FUN! Love your blog.